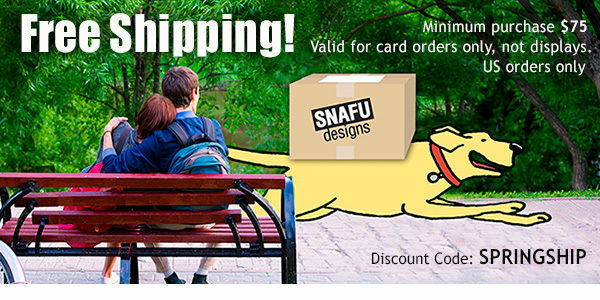 Wholesale Greeting Cards from Snafu! Greetings! Snafu Greeting Cards is a manufacturer of funny wholesale greeting cards that supplies fun cards for retailers in the USA and beyond. As a wholesale greeting card supplier we offer over 200 funny cards to order from. Unlike other companies our humorous greeting cards are a fresh alternative to boring cards offered by many other manufacturers. Order here – or request our wholesale catalog. You can order our wholesale greeting cards in half-dozen or full dozen packs, with or without a display. Minimum card order is just $75 or eight designs. To get started, check out our blog for more information and suggestions. We also offer Bestseller Packages to make your ordering easy! I hope you enjoy and will order the funny cards I design. If you need help or have questions, please don’t hesitate to call me, Scott, at 800-766-5786. If you are looking to buy just a few individual Snafu greeting cards, please visit our consumer site, SnafuCards.com.